It’s rare that a career gets a second shot, let alone a whole second act, but then Anthrax isn’t your average band. Formed in New York in 1981, the group that would go on to sell over ten million records and become the living embodiment of America’s hi-top wearing, riff-spitting, ear-thrashing answer to the New Wave Of British Heavy Metal has undergone not one, but two complete eras – but that isn’t their real achievement. More than the group who let a fledgling Metallica crash on their studio floor in 1983, who became a lightning rod for geekdom by immortalizing Judge Dredd with “I Am The Law” in 1987, who enthusiastically raised a middle finger to the critics and unimaginative fans alike by collaborating with rappers Public Enemy in 1991, and who – in 2011 with the release of Worship Music – proved that classic albums aren’t a bygone concept, the story of Anthrax is one of gritty determination in the face of outrageous odds. Anthrax continued their epic journey, releasing their eleventh studio album, For All the Kings, on February 26th, 2016. Are you ready for them to hit the stage on July 13th? They have a hell of a lot of songs to choose from; so get ready for a show to remember! 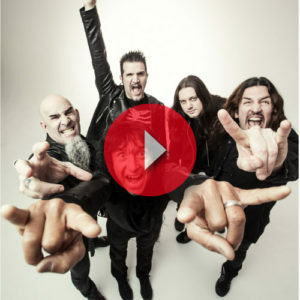 Have you heard Anthrax’s recent cover of the KANSAS classic “Carry on my Wayward Son”? The song is a bonus track on the new expanded vinyl edition of their album “For All The Kings.” Click the photo to listen to the cover now!